Premier Futsal is an exciting variant of the Beautiful Game and many of the games greats including Pele, Ronaldo and Neymar have had their initiation into the sport through this format. The 5-a-side game, an exciting mix of skills, goals, tricks and speed is set to hit Indian screens later this week. 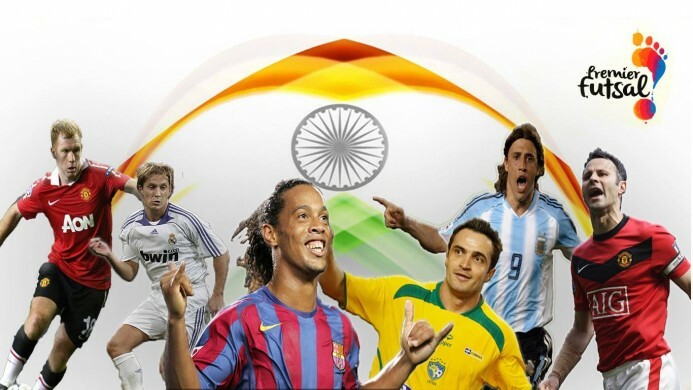 The league which is being organised in collaboration with the Futsal Association of India is set to feature some of the world’s most renowned Futsallers and football legends. The inaugural edition of the extravaganza will feature six teams split into two groups of three teams each, including representation from Chennai, Mumbai, Kochi, Goa, Kolkata and Bangalore. All teams will play each other twice with the top two in each group make it through to the Semi-Finals. The event will be staged at two venues namely the Jawaharlal Nehru Indoor Stadium in Chennai and the Peddem Sports Complex in Mapusa, Goa. The tournament kicks-off on the 15 of July in Chennai with the Final to be staged on 24 July in Goa. Arguably the most recognizable Futsal player in the world Falcao has been partly credited for the rapid growth of the sport. The forward currently plays for Magnus Futsal, a team in the Brazilian city of Sorocaba in the state of Sao Paulo. Falcao was recognized as the Futsal player of the year on four occasions in 2004, 2006, 2011 and 2012. With two World Cups and countless other honours for club and country he is often referred to as the ‘Pele of Futsal. He will turn out for Chennai 5s . The Premier League winner and former Chelsea and Inter Milan star is well travelled and also represented his country Argentina with several caps. The forward who is now earning his stripes as a coach will play for for Kolkata 5s. The former United and England midfielder who was known for his creative set-pieces and thunderous strikes from outside the box was Giggs’ partner in crime for many years with the Red Devils. Now, they could end up on opposite sides with Scholes set to dawn in the colours of Bengaluru 5s. The decorated former Real Madrid and Spain ace who won both La Liga and the UEFA Champions League in his decade long distinguished career at the Santiago Bernabeu is set to add even more stardust to the event. The defender will represent Kochi 5s in the first season. The former Brazilian World Cup winner who also attained legendary status at Spanish giants Barcelona was one of football’s most prolific goalscorers at his peak. Ronaldinho will put on those famous boots again as he brings some Samba magic to football mad Goa.